A Zambian woman trips and drops a bucket of water next to a homeless child (Maggie Mulubwa). Clearly, she decides, the child must be a witch. Off the silent girl goes to be tried in court, sentenced, and exiled to a rural prison camp for convicted witches. It all sound farcical, and it is – indeed writer/director Rungano Nyoni plays the story mostly for satirical laughs – but it is also something that really does go on in Zambia today. Old superstitions are mixed with government bureaucracy and political corruption, and the end result is the odd little feature I Am Not a Witch. The film has been shot on location in Zambia with a cast of non-professional actors. Its writer/director, Rungano Nyoni, is Zambian-born but grew up in Wales. The film has been made with British and French funding. It absolutely looks striking, shot entirely on location in largely rural areas with a very documentary-like aesthetic and feel. Nyoni does not overplay the situation or her characters, and gets plenty of excellent humour out of simply throwing characters into ridiculous situations and letting them play out. An early court hearing is a comic gem, with a bored local police officer listening to near-Monty Python levels of accusations – including one man accusing the girl of cutting off his entire arm (it is still attached to his body as he explains this). Later scenes fire fairly well-aimed shots at everything from local government to the arrogance of foreign tourists. The witch camp is a remarkable place, populated primarily by elderly women who all sit in compounds while tourists come to take their photographs and encourage them to make scary witch faces while coated in white face-paint. 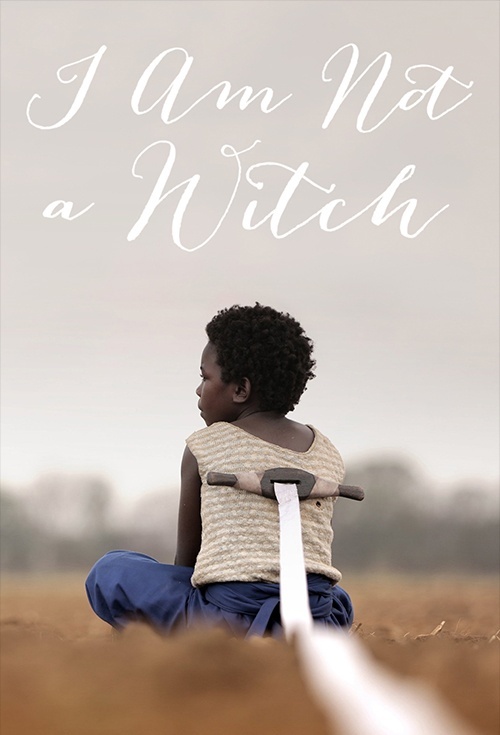 It is the elderly witches that give the girl a name – Shula – and who do their best to raise and nurture her in such a bizarre and oppressive environment. All of the witches are strapped to long white ribbons that are attached to enormous wooden spools; better to keep them reined in by their guards and stop them flying away. It is a completely surreal image, and one that is repeated throughout the film to solid effect. Before long a local politician named Mr Banda (Henry BJ Phiri) begins to use Shula for his commercial gain, leading to a particularly off-putting and bizarre appearance on local television. Phiri delivers a very strong comedic performance, done largely in deadpan mode. He would not seem out of place in an Armando Iannucci comedy like The Thick of It or Veep. In the film’s third act the comedy slips away, replaced by sudden and rather jarring tragedy. The shift from comedy to drama feels somewhat awkward and misjudged. It robs the humorous first two acts of a suitably amusing finale, and it comes enough out of left field that there is no real set-up to make the dramatic elements work to a sufficient extent. It finishes the film on a sadly disappointing note. Despite this, the strong beginning and middle are distinctive enough to be worth sitting through the rather miserable climax. The film marks an intriguing dramatic feature debut for Rungano Nyoni, and raises hopes that she will hone her crafts on a sophomore effort as soon as possible.